The clove tree is an evergreen which grows to a height ranging from 10-20 m, having large oval leaves and crimson flowers in numerous groups of terminal clusters. 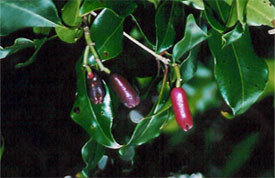 The flower buds are at first of a pale colour and gradually become green, after which they develop into a bright red, when they are ready for collecting. Cloves are harvested when 1.5-2 cm long, and consist of a long calyx, terminating in four spreading sepals, and four unopened petals which form a small ball in the centre. The flowers have a strong refreshing odour. If the seeds are allowed to mature, most of the pungency is lost. Each berry has only one seed. Flowering begins in about five to seven years. The buds are hand-picked when the heads develop a pink caste or just before they open. Cloves can be used in cooking either whole or in a ground form, but as they are extremely strong they are used sparingly. The spice is used throughout Europe and Asia and is smoked in a type of cigarettes locally known as kretek in Indonesia and in occasional coffee bars in the West, mixed with marijuana to create marijuana spliffs. Cloves are also an important incense material in Chinese and Japanese culture. The compound responsible for the cloves' aroma is eugenol. It is the main component in the essential oil extracted from cloves, comprising 72-90%. Eugenol has pronounced antiseptic and anaesthetic properties. Clove essential oil is used in aromatherapy and oil of cloves is widely used to treat toothache in dental emergencies. 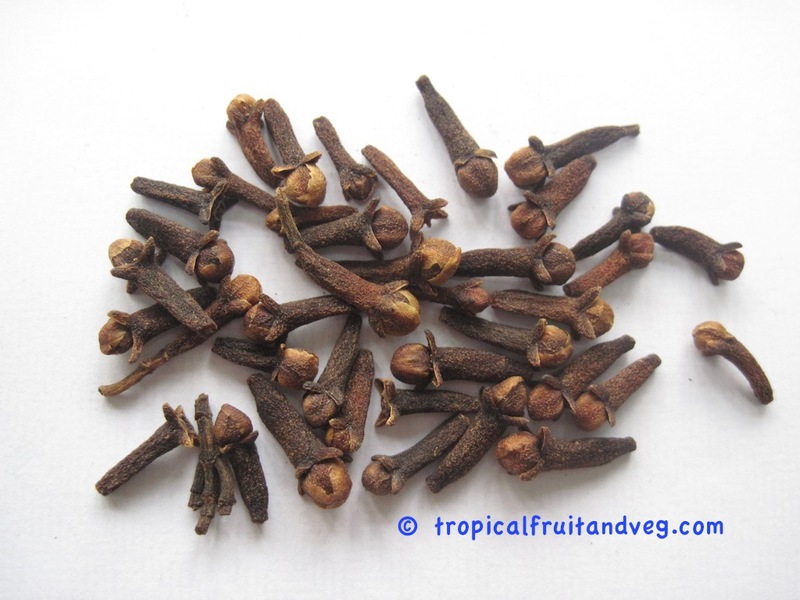 Cloves require a humid, warm tropical climate. It prefers partial shade and a cooler climate with well distributed rainfall which is ideal for flowering. Clove grows well in rich loamy soils of the humid tropics and can be grown successfully in the red soils as well as in the hilly terrain of the Western Ghats. Since the crop cannot withstand water logged conditions, clove needs good drainage. Cloves are usually propagated by seeds or by cuttings. Fruits for seed collection are allowed to ripe on the tree itself and drop down naturally.The seeds can be sown in a loose soil-sand mixture prepared with well rotted organic matter, on raised beds. Seeds are sown at 2-3 cm spacing at a depth of about 2 cm. The seed beds have to be protected from direct sunlight. The seeds will germinate about 10 to 15 days.